My mom always made the best chicken salad when I was growing up. She cooked the chicken herself and mixed it with all the things I love in chicken salad – grapes, pecans, celery and onion. And she never used too much mayo. I never really liked mayonnaise, but I could tolerate it in mom’s chicken salad. (And potato salad. And tuna salad.) Only because she used just enough to make it stick together without getting gloopy. I blame my mom for my aversion to all store-bought salads because hers were always so much better. The store-bought kinds always use way too much mayonnaise-y dressing and taste kind of gross. Ever since Greek yogurt became mainstream, I’ve been using it in place of mayonnaise in all of my salads. And really everything else, too. It’s just so versatile and so much healthier than mayo or sour cream. I always keep a big tub of plain Greek yogurt in my refrigerator to use in my everyday cooking, like in this Greek yogurt chicken salad. 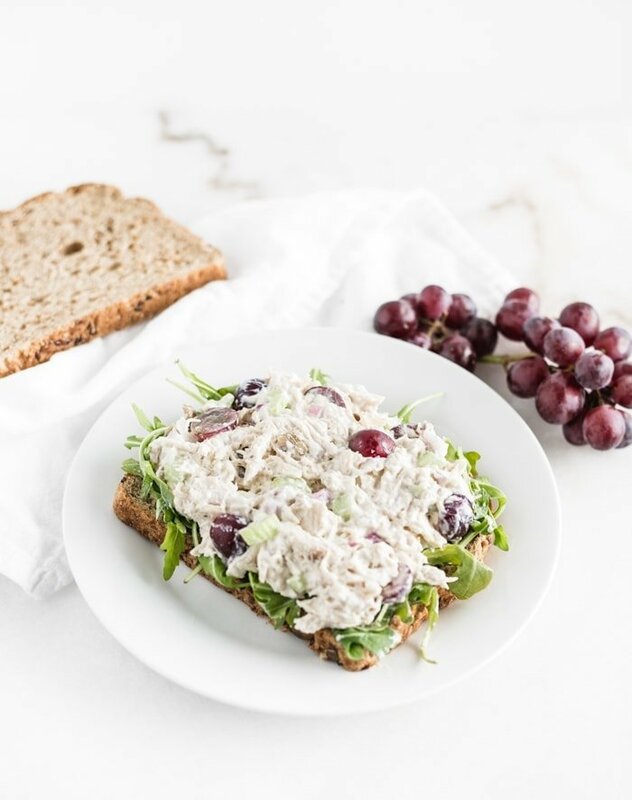 It makes a creamy, slightly tangy chicken salad without using globs of mayo, and it packs your lunch with even more protein! I love the combination of sweet grapes, crunchy pecans, and crisp celery, but stir in or leave out whatever you’d like to suit your taste. 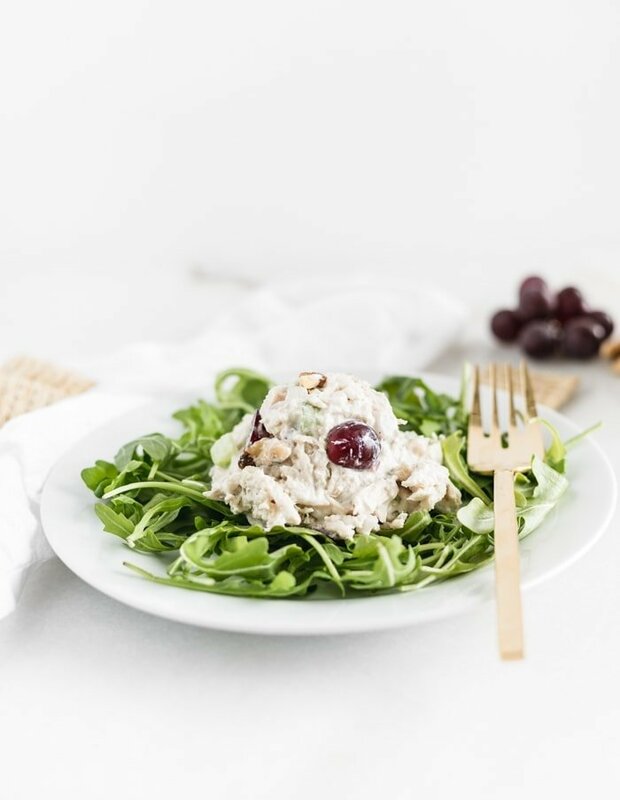 This delicious, healthy chicken salad is perfect for casual brunches, summer picnics, work lunches, and super quick dinners. It’s easy to prepare on the weekend to have ready to go in the refrigerator for easy eating all week long! In a large bowl, mix together all ingredients, stirring until chicken is evenly coated. Store in the refrigerator in an airtight container. Is this still good to eat all week? Yes, it should be good all week as long as it is stored properly! I just made this last night and plan to eat it for lunch for the next few days. It is delicious! It was easy to make and it tastes good. 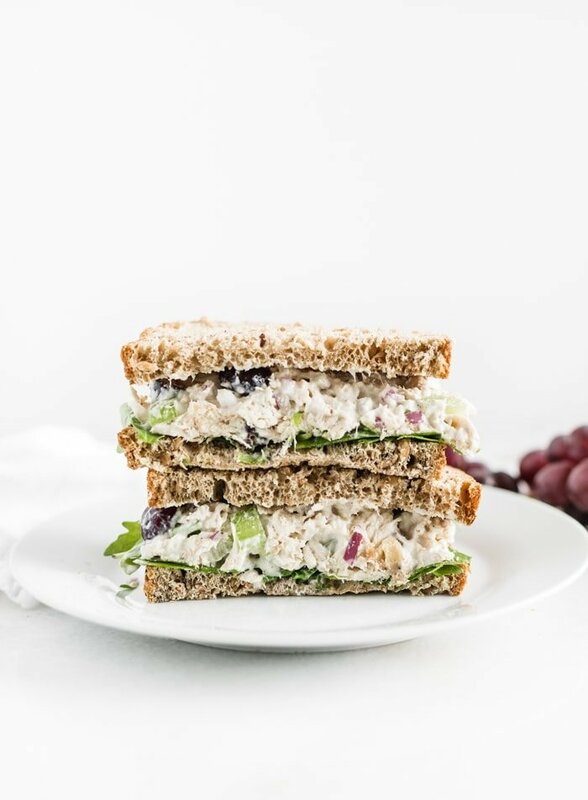 The chicken salad can be made up tp a couple of days in advance, but I wouldn’t assemble the sandwiches more than a couple of hours ahead of time so that the bread doesn’t get soggy. Enjoy! I don’t provide nutrition information but you can calculate it using one of the many online calculators or apps.